From using magic tricks in experiments to the special nature of the ‘aha’ moments caused by the tricks themselves, the wonder of magic and its role in science were examined in a series of talks at Goldsmiths, University of London. The day was organised by Dr Gustav Kuhn, who started off as a magician and later moved into psychology. He said he was quite shocked at the lack of academic literature on magic and psychology – things he sees as inherently linked. In his studies he has looked into how one of magicians’ most important techniques, misdirection, is perceived by humans and the mechanisms behind this. After publishing this work and a framework paper on the links between science and magic, the field became much more popular with academics with a surge, around 15 years ago, in the number of published works on the subject. Indeed, all of the speakers at the event showed that science and magic fit together. Thomas Strandberg (Lund University) carries out research largely into choice blindness, offering up considerable opportunity to use magic as a tool. The phenomenon describes situations where humans will defend and justify a choice they believe they have made – even if they didn’t make it. For example, some of the early work on choice blindness involved giving participants the choice of two pictures and by sleight of hand the participant was given the one they turned down. Researchers found that when asked why the subject chose that picture, they will justify their choice. Strandberg and his colleagues wanted to see if this phenomenon transfers to political and moral beliefs. In a simple but smart experiment they stopped subjects on the street and asked them to fill out a survey that asked them to rate their agreement with moral statements. Upon turning to the second page of the survey a clever little bit of magic removed the original moral statements (using some adhesive on the back of the clipboard) to reveal a new set of moral statements – which completely opposed those they initially rated their agreement with. When asked to read through their answers participants still justified their choices – some even gave anecdotal reasons, for example ‘I was speaking with my mother about this the other day…’. Having a ‘eureka’ or ‘aha!’ moment is quite a strange psychological phenomenon when we look at it more closely. Dr Amory Danek (University of Illinois) has used magic to look into this ‘insightful problem solving’ – when the solution to a problem suddenly comes to mind seemingly out of nowhere. These moments require that a person change their fixed way of thinking, whether this be in reassessing the nature of objects as in some magic tricks or in something as mundane as using a tool for a different purpose. Danek said that to do this a person must overcome something in their knowledge that they would never usually question: a conceptual change. In some of her work Danek showed participants short filmed magic tricks three times and asked them to come to a solution on how they were done. Magic tricks are the perfect stimulus for insightful problem solving – magicians create false assumptions in their tricks, and to overcome these assumptions one must be flexible in one’s thinking and challenge previously held ideas about the nature of things. Danek is aiming to combine behavioural and neuroimaging experiments in order to identify brain regions that are used when we are confronted with stimuli that violate one’s expectations. The day also included fascinating discussions on the potential use of artificial intelligence in creating optimised versions of magic tricks, and two keynote speeches from Peter Lamont and Ronald Rensink on the potential for developing a science of magic as a whole. Could magic to be used to influence thoughts you feel you have total control over? Jay Olson (McGill University) has carried out some fascinating research into free will using magic as part of the study. He asked whether, using the magician’s technique of forcing, a person’s seemingly free choices could be manipulated without their knowledge. Using a dummy MRI scanner Olson convinced his participants they were lying in a machine that could read and influence their thoughts. He asked his 55 participants to think of a number between one and 100 which the machine would ‘guess’. In the next room was a printer (which was not even plugged in) which ‘printed’ the number they were thinking of. Olson said participants were convinced the machine was working – however, he had influenced which number was chosen using a technique used by mentalists. Second the subjects were told the machine would plant a number in their minds – using the same clever technique – and participants believed this was really happening. Some even reported feeling warm sensations when the machine was working to ‘affect’ their thoughts. Using the Sense of Agency Rating Scale, the researchers found people felt more control in the first condition and much less in the second. They felt as if they had made a free choice of number in the first condition but had actually been influenced – using just a little bit of magic. Olson said this showed it was possible to make people believe they didn’t have control over their own thoughts, and from this he would be able to answer questions in the future around why we feel we have control over our thoughts when we actually may not. Chris French (Goldsmiths, University of London) gave a fascinating talk about magic and the paranormal – revealing some interesting facts on paranormal belief among magicians themselves (surprisingly high, given the number of famous sceptics in the magical community). He also told the fascinating story of James Randi’s project Alpha – where he used two magicians to convince a group of researchers they were psychics, which many fell for. A touching talk by Yvonne Farquharson demonstrated how magic can be used in a clinical setting. Farquharson is Managing Director of Breathe, an arts health research not-for-profit, which came into being through Guy’s and St Thomas’ Charity. She and her colleagues teamed up with magicians from the Magic Circle to help young children with hemiplegia. Children with the condition, which leads to partial or full paralysis of the hand and arm on one side, are required to carry out lots of exercises to help with their dexterity. As Farquharson pointed out, these exercises are boring to most of the children. The magicians were advised by occupational therapists which fine motor movements needed to be practised, and the magicians incorporated this into a set of magic tricks. These tricks were then taught to the children in a fun ‘magic summer camp’ held over several weeks. In a video we saw the young children, who previously had trouble zipping up tops or undoing buttons, carrying out these tasks – one remarking ‘This is so easy!’. Not only was their dexterity improved but seemingly their confidence and self-esteem. The project is now being rolled out to help adolescents with mental health and anxiety problems. 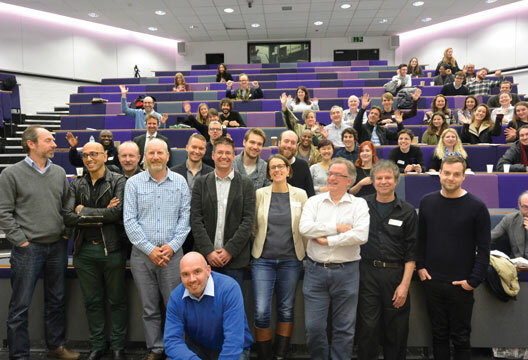 The workshop was funded by the Experimental Psychology Society and organiser Gustav Kuhn said he hoped one of the outcomes of the event would eventually be the establishment of a Science of Magic Association, which would aim to organise and run similar conferences in future and support the collaboration between science and magic. - Read more on the use of magic and illusion in the history of psychology.